Take to the streets in Urban Champion. 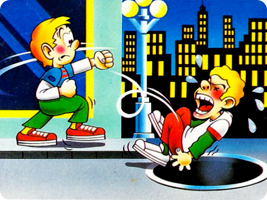 Punch and block your way through a series of increasingly challenging opponents, pushing them closer and closer to the manhole. Don't get caught out by the angry residents or the police patrol car, or else your rise through the ranks will be cut short.